Sorry for the gap between this post and my last one! For quite a few days now I’ve been planning on making a post, but I kept getting tired before I could finish. Also, ever since Teru told me about sprite ripping, I’ve been very distracted in trying to figure out how to do it myself (with no success :P). I’ll try not to be distracted from my next project: fixing my old posts (image widths, spacing) to look better with this theme (I used to have the theme Rounded, and briefly, Twenty Ten). My next highest priority project is to put up a patterns page. Well, last week I kind of left everyone hanging about whether or not I won the Bug-Off, but I did! It’s my first trophy in this town! 😀 I was still wearing Teru’s lovely butterfly shirt that I appropriately wore for the Bug-Off itself. There have been lots of rainbows in Dafdilly lately: this one last Monday, another a few days later, and one yesterday that I got multiple pictures of as it grew brighter and then faded. What a heavy hint. 😆 I didn’t waste any time and went straight to Nook, not even stopping to see what it looks like. I was very tempted by this crown since they don’t show up often, but I only had ~700,000 bells in my bank account at the time. I even started trying to make 300,000 bells so that I could buy it, but after selling all my fruit for about 100,000, I decided that it wasn’t the smartest thing to empty my bank account for. Besides, I bought one in my original town (saved in my dad’s town)… I kind of want to buy one in Dafdilly eventually, though, and a royal crown, too. I’d heard two different requirements for pixie cuts: one being that you need to get all of the girl haircuts first and the other simply being that you need to get a certain number of haircuts (forgot how many >_<). It definitely seems like the latter because while I switch back and forth between various haircuts with Twisk, I've never even tried some haircuts on her, like one of my favorites, the bun. Joey moved out Friday, but I got a picture before he left. 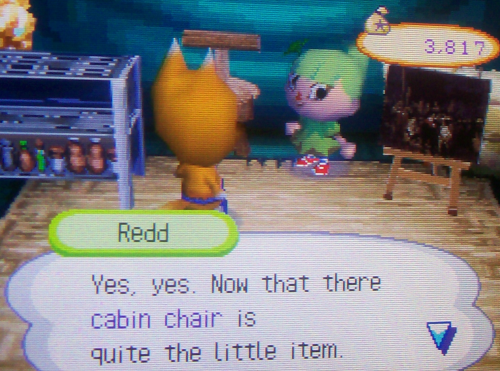 She gave me three furniture items I’ve been wanting for a long time: a lovely phone, apple tv, and cabin chair! And later on she gave me a bag of 99,000 bells! 😯 Thank you, that was so nice! I wanted to give a few things in return, too, so I gave her an Arc de Triomphe model I got from Gulliver recently, a meadow vista, a groovy shirt, and a few plants. She also let me hunt for buried treasure in her town; I found an executive toy, mini puffoid, lucky gold cat, lovely kitchen, round cactus, skeleton, anatomical model, lucky black cat (don’t think I’ve ever had this before! ), big festive tree, oil drum, and arcade machine! Twisk and Dawn were morphed after visiting Gabi’s house and we had fun taking strange pictures of the sight. Kammile prepares for things a lot sooner than I do (I’m a procrastinator :P); she first started preparing for her upcoming Halloween party in August, I think! I love this dining room! The flowers on the table are a nice, realistic touch. And I was excited to see this new sky balcony! 😀 I’ve had a room similar to this before (but not a balcony), with statues, columns, and an outdoor bath; I just love the atmosphere with the running water. Her new decor has really increased her HRA score as well! …lol 😳 I was surprised to see that those button-controlled sayings work when sitting on a toilet, to be honest. really fun, but I had to cut back on taking pictures because my camera’s memory card was getting full. Hopefully she got a lot more than I did! Wow, I love the patterns at her Ables’! Such a talented pattern-maker. Next, Dawn came over to my town and I had time to put the furniture she gave me into my house real quick. I got a tissue box in the mail later. 🙂 Once I bring over the ~5 million from my previous town (currently stored in my dad’s town), I’ll be well on my way to earning the piggy bank. There’s also a poll in my sidebar now. It’s just for fun, but I’m curious to see the votes! And now it’s full of baby trees! Posted on September 26, 2011 by Amy •	This entry was posted in AC:WW, AC:WW WiFi, Dafdilly and tagged Animal Crossing. Bookmark the permalink. Wow… that map must have taken a LONG TIME! I just wanted to let you know that after you design something on top of another pattern, if that “another pattern is on the ground”, then it will change by itself and you won’t need to pick it up and lay it down again. I would have put down a path but mine always look messy. That nice map layout makes me want to put down another path. Hey, question: When is the grass or trees going to change next? (Since you knew that it was going to change on Sept. 16th) Maybe Oct. 1st? Great job on the map! And may I ask with which program you made the image? Programs really help when doing these type of images and I would like a similar program to design my paths! Thank you Amy and a million congrats! Use this link (http://acww.sarouk.net/TownGen.php) to make a gridded version of your town map by choosing the corresponding acres… I’m going to get my DS so I can do this and lay down a path once and for all! I’ve always picked mine up after a few days because I feel like mine are always messy and not planned well. Haha, thanks for voting! 😛 I guess Kammile's been busy with school for a few days. She did say in her last post that she was going to be cutting back. Ps: I love your map! Well I have a question: Did you now how to do a new chat box? No, sorry, I’ve never had a chatbox and I have no idea. xP Why, do you want a new one? I thought you got a new one with the help of Jemma a few days ago.